Trade shows are an important marketing opportunity for businesses of all sizes to meet new and existing customers, and to forge strong relationships within their business niche. Because of this, an effective booth design is extremely important. Our designers recognise the importance of creating an eye-catching booth that makes the most of the available space. The more effective a booth design is, the more foot traffic your business will enjoy on the day. However, space, or lack thereof, is often a major issue at trade fairs. With hundreds of businesses competing for attention in a restricted space, it can be hard to stand out from the crowd, therefore anything you can do to make your business unique in a crowded marketplace is crucial. A trade show booth needs to accurately reflect your brand and company ethos. In order to create the perfect design, our designers will work with you to find out the kind of image your business wants to project, and what your customer demographic is. It is very important that a trade booth provides a great customer experience, we will help you achieve this. 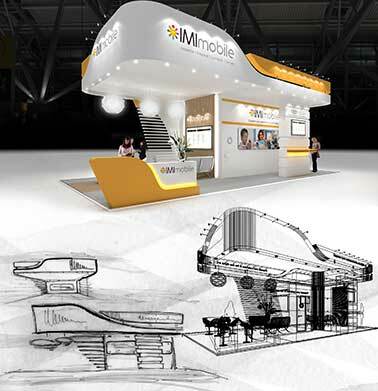 There is no doubt that with the right trade show booth design, your business will enjoy great success on the day.